Blake's Lotaburger is a popular local chain of fast food burger restaurants found throughout the state of New Mexico. Blake Chanslor served his first Lotaburger -- the signature sandwich of the restaurant -- from an Albuquerque hamburger stand in 1952. The menu also features the mini version of the Lotaburger, called Itsaburger, "special recipe" red chili and beans, pulled pork sandwiches, breakfast burritos, and hot dogs. 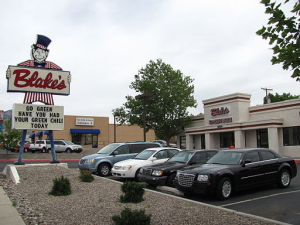 Additionally, Blake's uses green chili on its burgers and other menu items, an ingredient known throughout the United States as unique and special to New Mexico, with the best chilies coming from Hatch Valley. "Blake's Lotaburger on Montgomery Boulevard, Albuquerque New Mexico, May 2010" by John Phelan is licensed under CC BY. 2014 "About Us." http://www.lotaburger.com/about-us.html, accessed June 17, 2014.